Olaf II Haraldsson, the saintly king who fell at the battle of Stiklestad in 1030 and canonized the year after, quickly became a legend in the making, much due to the writings of Snorri Sturluson. Growing up I, as many others, came to know Olaf as the driving force behind the Christianization of Norway, and as Rex Perpetuus Norvegiae – the Eternal King of Norway. But who in fact was Olaf II Haraldsson? The story goes that Olaf already at 12 years of age went to sea, and raided with the Vikings. 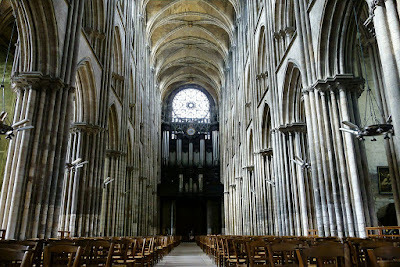 During the winter of 1013/1014, Olaf had a longer stay in Rouen in Normandy, where he was the guest of Duke Richard II. The Normans were descendants of Norwegian and Danish Vikings, and had converted to the Christian faith, feeling very strongly for this new way of life. Spending much time with the Duke, Olaf learned about Christianity and was eventually brought to the cathedral. There are many reasons for why Olaf during this period decided to converse to the Christian faith, and letting himself be baptized. One of them must undoubtedly have been the splendor of the cathedral in Rouen, the incense and the Gregorian chant, which together may have given Olaf a spiritual experience as so many others before him. The Christian outlook on life after death might also help to explain this transition, in which many of his men joined in. In addition, Olaf was very much inspired by the stories of Charlemagne, giving him the vision of a strong, unified Norway founded on the implementation of the Christian faith. The advent of the Christian law however, was not unproblematic to say the least. Implying an evident break with longstanding traditions, the social consequences quite often emerged as prohibitive and out of the question. A man for instance, who was married to several women, now had to send away one or several wives, slave owners had to see that their slaves were redeemed and set free, no work was to be conducted on Sundays or during holidays implemented by the church, and so on and so on. In cases of people openly opposing the Christian injunctions, Olaf was unalterable – despite was met with heavy threats of violence. These threats, orchestrated in order to enforce the law seem on one hand to have had an effect; nevertheless, they ultimately contributed to his downfall. 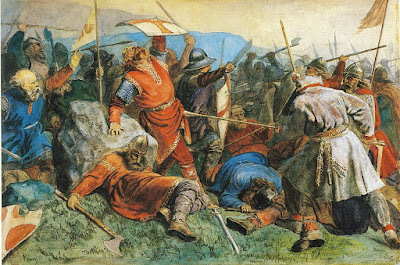 On July 29th 1030, 35 years of age, Olaf II Haraldsson died at the battle of Stiklestad after several noblemen had turned against him. According to Passio Olavi (Eng. "the Passion and miracles of the Blessed Olaf"), Olav's body shortly after was placed in a shed, where a blind man received his sight again as he rubbed his eyes with water which Olaf had been washed in. The body was eventually buried in a sandbank by the river Nidelva, and when the coffin was dug up a year after it was claimed that Olaf’s nails, hair and beard had continued to grow. On this basis, Olaf was declared a saint, and the cult of St. Olav spread rapidly throughout Northern Europe. Churches in honor of St. Olav's was built not only in Scandinavia, but also in major cities such as Novgorod, London and York. Beside Virgin Mary, Olaf II Haraldsson became the most often depicted saint in Nordic Medieval art, both in painting and sculpture. From the 1100s and up until the Reformation, the saintly king is displayed either standing up, crowned and with an ax in one hand, or sitting down, often with a monster underneath his feet - the symbol of the evil forces he overcame. “Olaf's well” is a small freshwater spring on top of Hammer mountain, a forested crag in municipality of Lørenskog in the south-eastern Norway. Located right nearby the local church, which dates back to the 12th or 13th century, the well is 8.7 meters long, and around 3 meters at its widest. It is renowned for never drying out, not even during prolonged droughts. 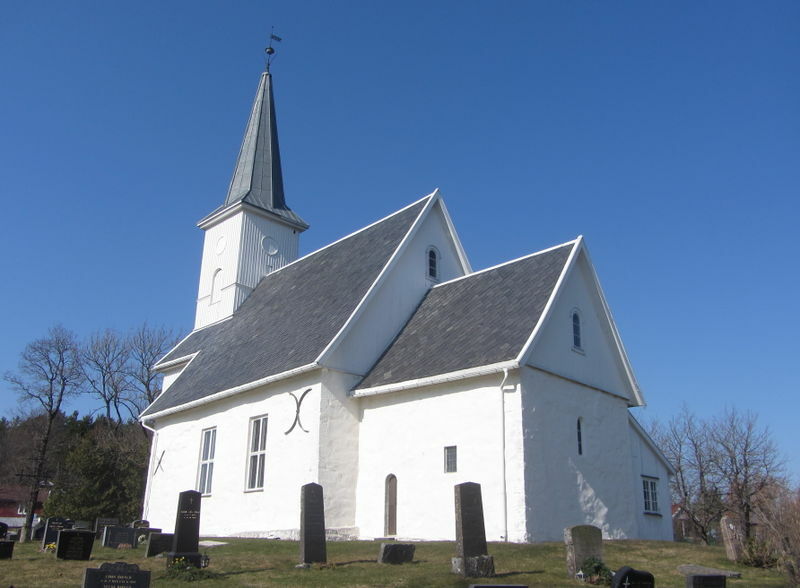 According to legend, Thor had been furious when he saw that it was built church on Hammer. With all his strength he therefore threw his hammer, Mjolnir, towards the church to smash it. 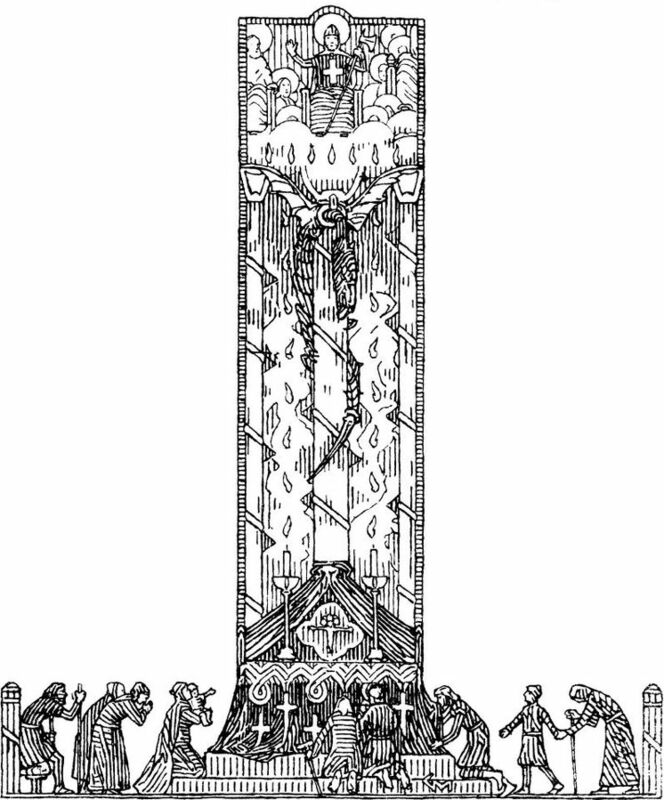 However, the saintly King Olaf exceeded Thor in brutal force, and forced Mjolnir to change direction. Instead, the great hammer hit what is today known as Hammer Mountain. Mjolnir made a scar in the rock, and at this very spot a little well sprang forth, later on named after the King how saved the church. 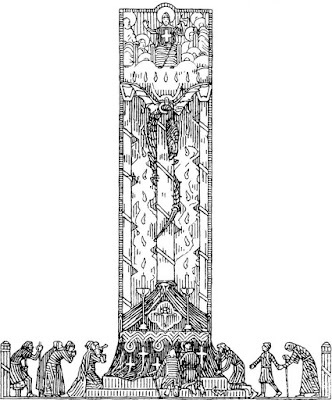 The well was said to bring health and happiness, and through the ages, many visited the spring of St. Olaf to drink, fill up their water supplies, or to throw pieces of money in hope for good fortune. Pilgrims heading to St. Olaf's grave in Nidaros (Trondheim) gladly passed through Lørenskog to visit St. Olaf’s well when they arrived from Oslo. 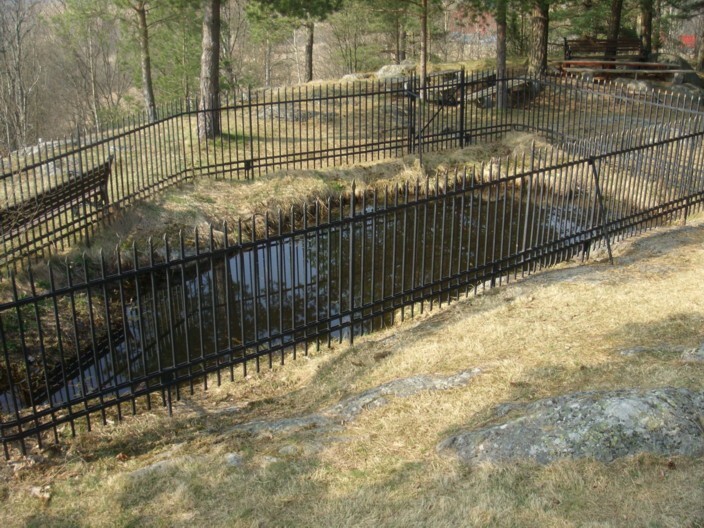 The legend of the St. Olaf well in Lørenskog is not unique. All over the country, there are other springs supposedly existing due to St. Olaf, which also been subjects of pilgrimage. A common feature of the sources is that they are named after and associated with King Olaf, worshiped as a saint in the whole of northern Europe, and a force to be reckoned with in the Norwegian folk tradition. By the Catholic Church, Olaf II Haraldsson is officially considered the national saint of Norway, and as Rex Perpetuus Norvegiae – the Eternal King of Norway. To this day, Olaf’s death is commemorated annually on July 29th, during a national celebration by the name of Olsok, (Eng. “Olaf's Wake»). However; the narrative teaching us that is was Olaf alone who introduced the Christian faith to the Norwegian population is incorrect; just as there were heathens, there were also Christians, before and after Olaf’s accession into Norwegian history. 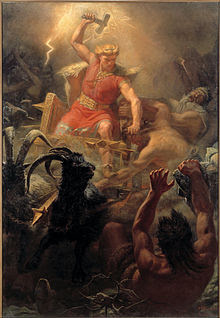 Reading about this specific legend also had me wonder; there was a time when it was Thor who battled the agony and hostility of the world, then in form of trolls – jotner. Suddenly, it was Thor who needed to be overpowered? When the stories tells us about Saint Olaf winning over trolls and Norse gods alike, it is ultimately the heathen folk belief system which is truly put to the test. Although our modern day culture bear witness of the Christian heritage and set of values, I always find it interesting to keep in mind that things however, at one time, were quite different. Living in the outskirts of the world, the Vikings had the perfect facilities at their disposal to develop their very own mindset and way of life. 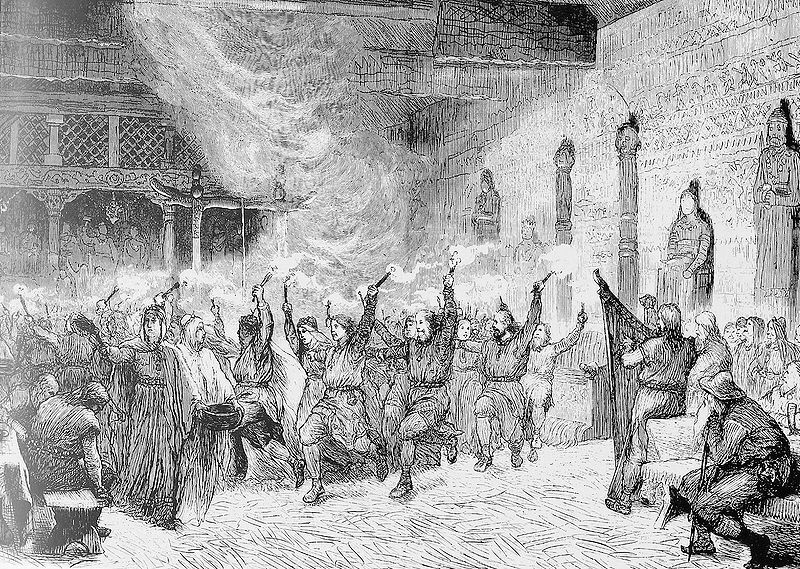 It is also important to remember, that although the Vikings brought with them their Norse mindset on their journeys, the religious practice of their belief was to a great extent related to the family farm. During their month long travels, it is therefore natural to envision that unfamiliar belief systems and practices might be objects of great curiosity. Although Norway was Christianized relatively late compared to the rest of Europe, the Norsemen, being mariners, warriors and merchants, early came in contact with the Christian practice and belief system. In England, Ireland, Germany and France, they met not only large–scale and alluring riches, but also a social structure and a set of values completely different from their own. In spite of Harald Finehairs’ previous efforts, Norway had yet to be united into one kingdom, and remained as a variety of small, undisputable regions under the control of mighty nobles of age-old ancestry. In England and on the continent, the communities were organized in a fashion implausible to a Viking. One hand, there was society itself, built like a pyramid, with the slaves at the bottom through the tenant farmers, then the nobility and the king at the top, whom the nobility had pledged allegiance to. On the other hand, there was the Christian faith, emerging as a fixed doctrine based on one great book. Supplemented by the ecclesiastical tradition, as well as incorporating ancient cosmology, this theology represented a mindset, a view of history and society that must have puzzled a Scandinavian Viking. The Church communicated a message compromising all knowledge known to people at the time. And the message was not aimed at one family or region alone - the target group was none other than the entire human race. Although regularly hosting the sacrifice of Jesus' flesh and blood during the service, this cult must still have seemed strangely abstract and literally anemic for a Viking, if one compares it to a Viking blot. For the Norse religion was not founded on a belief in the Christian sense, for there was no doctrine and no theology to believe in. The Vikings inhabited a world where the gods were just as real and just as present as any neighbor - and equally temperamental. When storms were raging and lightning struck and farms were razed to the ground, they knew Thor was angry for some reason. And when crops failed and famine impended, they were aware that it was Freyja who felt insulted. On a farm, completely entrusted to the forces of nature, it was actually reassuring to know that the gods had a human face, and thus were possible to influence. In this sense, the gods were all time present, a matter of course that had to be cultivated and fed, just as the farm animals. When the differentiations were so fundamental, it is difficult to understand how the transition might ever have happened in the first place; surely, it could not have been a matter of a conversion in the modern sense, but rather a dramatic transition from one world to another. God was far more remote than Odin and Thor, and heaven far more difficult to reach – in all his holiness, the almighty appeared as a reserved and distant character. To even be aware of his very existence took a great deal of know-how. Christianity therefore had to have a creed to guide people on the right path. The idea of God being not just one, but three, and yet still only one, was not exactly easy to understand. For people who were accustomed to gods inhabiting their everyday lives, helping and supporting, or punishing and retaliating – on an equal foot as men – it must have been difficult to comprehend what Christianity was really about. The Christian missionaries had a problem indeed; to preach theology would fall on deaf ears. Through the use of analogy or comparison however, it was possible to find an intelligible approach. Hence, Jesus was kind as Balder and just as Balder, he was unjustly murdered. Simultaneously, Christ managed to give Satan a fatal stab, just as the brave Sigurd who alone succeeded in killing the dragon Fafnir, with his sword Gram (‘Gram’ meaning wrath). When Thor himself failed to capture the Midgard Serpent (norse, Miðgarðsormr) with a bull’s head (! ), Jesus succeeded using his cross as a fishing pole. This was an important approach, for in the Norse religion, the whole point was that the gods were assertive and authoritative. With Odin on your side, you could win over your enemies, and if one stood on good terms with Freyja, crops would prosper and the women would bear strong, healthy children. For Jesus to even stand a chance in such a society, he had to be perceived as stronger than the old gods. When the likes of Olaf II Haraldsson converted pagans throughout the land through the use of swords and death, it in turn became clear that the Christian God exceeded the Norse ones in dominance and posture. By reusing the ancient Norse myths, the new god was brought effectively to life, and as a consequence Jesus not only appeared as gentle and kind, but as a mighty force which exceeded all of the old gods combined. Despite the turn of events, the shift of faith was consequently implemented without the old culture being completely eradicated - it got rather a new feature. In retrospect, this might explain why we are so fortunate to know so much about the ancient religion, as so much of the old traditions and symbols initially were prolonged and adjusted into the new religion, and new way of life. Gunnar Danbolt (2004). Norsk kunsthistorie. Bilde og skulptur frå vikingtida til idag. 2. utgåve. Det Norske Samlaget: Oslo.